2008 is not four weeks old, and yet what will have to be the silent DVD release of the year has already been announced. 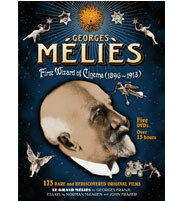 It won’t become available before 3 March 2008, but that just gives you a month’s worth of delicious anticipation, awaiting Flicker Alley’s thirteen-hour, five-disc DVD release, Georges Méliès: The First Wizard of Cinema (1896-1913). The collection brings together over 170 films, comprising nearly all the surviving films of Georges Méliès (he made just over 500), from his first 1896 production Une partie de cartes (discovered by yours truly some twelve years ago – my very modest claim to early cinema fame), to his uproarious final film, Le voyage de la famille Bourrichon (1913). It includes such classics as Voyage dans la lune (A Trip to the Moon), Les quatres cent farces du diable (Satan’s Merry Frolics) and A la conquète du pôle (The Conquest of the Pole). Fifteen of the films are reproduced from partial or complete hand-colored original prints, while thirteen are accompanied by the original English narrations meant to accompany the films, written by Méliès. 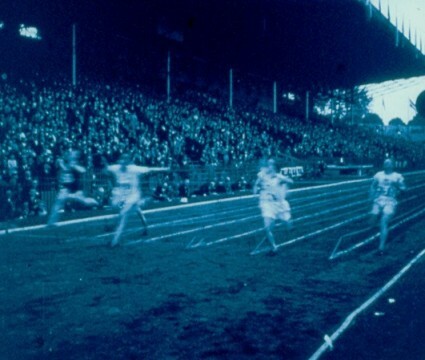 The collection has been put together by the pre-eminent preservationist-producers Eric Lange (of Lobster Films) and David Shepard, from archival and private holdings in eight countries. A major extra is the half-hour documentary, Le Grand Méliès (1953), made by Georges Franju, which features Georges Méliès’ widow and star of many of his films, Jehanne d’Alcy and André Méliès portraying his father. 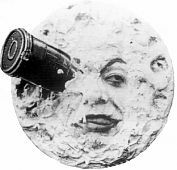 Georges Méliès (1861-1938), the pre-eminent artist of early cinema, a creator of ingenious fantasies coming out of his magicianship background, but which employ the cinema’s own entrancing trickery to the full. The sheer joy of filmmaking that his films express means that his best work does not date and continues to delight each generation that comes across him (just take a look at some of the admiring comments made of the many films of his to be found on YouTube). He is particularly deserving of the complete box set treatment, even if the majority of the films that he made are now lost (though more titles keep turning up). It is seventy years since his death, and presumably it is no accident that the DVDs are appearing this year, since under European law his films should be coming out of copyright in 2008 i.e. the rule that says copyright remains in a film production until seventy years after the death of the author. What the position is of the Méliès family, who have been so protective of his heritage up until now, I don’t know. Perhaps one of our knowledgeable readers might be able to say. At any rate, warmest congratulations to Messrs. Lange and Shepard for a herculean piece of work, and to Flicker Alley for issuing such an ambitious release. It’s available at special pre-order price of $71.96 (do note that it will be Region 1 DVD). I’m off to pre-order mine.